A radical new approach to energy innovation is needed if the sector is to meet the demands placed on it by the Paris Climate Agreement and play a positive role in the fight against climate change. This is the main finding of a white paper, Accelerating Sustainable Energy Innovation, published by the World Economic Forum. With energy consumption and production representing two thirds of global greenhouse gas emissions, business as usual is no longer an option. Increasing the pace at which innovative sustainable energy solutions get to market is critical to diversify the energy technology landscape and to meet the Paris targets at affordable costs. 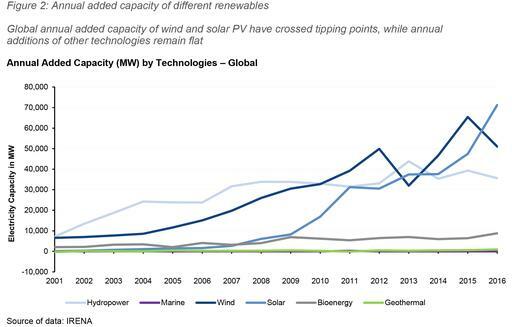 The white paper, produced with analytical support from KPMG, highlights that while technology and innovation policies have been successful in rapidly scaling up some renewable technologies such as solar, photovoltaics and wind power in the past decade, the breadth of innovation and the way it has been coordinated have been disappointing. Because investments in energy technology typically require long investment horizons and entail high technological risks, the sector has struggled to attract sufficient amounts of funding, or to align the investments of those active in the space. “Unleashing the full power of entrepreneurship and innovation across the energy system is at the crux of delivering global climate goals and spurring new opportunities for growth. We must take advantage of the Fourth Industrial Revolution to bring about a step change in investments and accelerate the pace at which new technologies are brought to market,” says Cheryl Martin, Managing Director and Head of the Global Centre for Innovation and Entrepreneurship, World Economic Forum. The paper highlights a set of ideas that were identified to channel more investment into R&D and fast-track the road to commercialization, targeting regulatory frameworks and financial mechanisms. At the international level, the paper calls for a new global fund modelled on successful funds in other sectors to provide a secured and focused financing mechanism to tackle some of tomorrow’s most important energy technology challenges. One year since the start of their formal collaboration, the World Economic Forum and Mission Innovation continue to strengthen their partnership. In co-designed sessions at Mission Innovation’s third ministerial in Malmö, the collaboration is bringing together government ministers, industry CEOs and innovation pioneers to move to action on innovation challenges, discuss how to implement ideas, and set a precedent for the public-private partnerships that are required to accelerate sustainable energy innovation. Recognizing the need to significantly accelerate the pace of innovation in sustainable energy to meet the goals of Paris Climate Agreement and reap broader economic benefits, the World Economic Forum launched the project after its Annual Meeting 2017. The project serves as a platform for public-private collaboration to address systemic barriers to faster innovation and commercialization of sustainable energy technologies and solutions. For additional information or to view the report “Accelerating Sustainable Energy Innovation” click on the link https://bit.ly/2IVvs1B.